Don't design your own honey labels - get them from Thorne's. And that's what Hamish Symington told us on the CBKA Improvers' course. He's a graphic designer, so he actually had designed his own labels. But designing and printing labels is a process that most of us are neither good at nor geared up for. However, after trawling through all the label designs that Thorne's website had to offer and many more besides, I found I just didn't really like any of them. 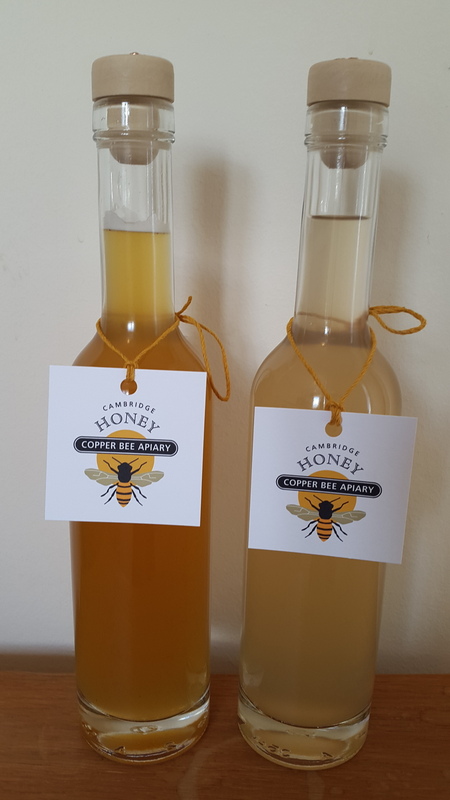 As things have turned out, working on the packaging design and branding for Copper Bee Apiary has been an unexpectedly engaging and enjoyable offshoot of beekeeping. For this I have to thank in large part Susan Harnicar Jackson, the artist behind the logo and label designs. Susan is a joy to work with, being creative, pro-active, responsive, thoughtful and enthusiastic. I am indebted to her for her striking honey label, which she has kindly allowed me to use on the website as well. Receiving packages from America containing the latest labels and/or tags, always beautifully wrapped and presented, has been something to look forward to!